…A TORNADO WARNING REMAINS IN EFFECT UNTIL 315 PM CST FOR NORTHEASTERN ELMORE…WEST CENTRAL TALLAPOOSA AND SOUTHEASTERN COOSA COUNTIES… At 307 PM CST, a severe thunderstorm capable of producing a tornado was located over Equality, moving east at 45 mph. IMPACT…Flying debris will be dangerous to those caught without shelter. Mobile homes will be damaged or destroyed. Damage to roofs, windows, and vehicles will occur. Tree damage is likely. Locations impacted include… Equality, Highway 9 and Highway 22, Cottage Grove, Nixburg, Kowaliga Bridge, Western Lake Martin, Southern Lake Martin, Eastern Lake Martin, Fishpond, Central and Ray. …A TORNADO WARNING REMAINS IN EFFECT UNTIL 315 PM CST FOR NORTHEASTERN ELMORE…WEST CENTRAL TALLAPOOSA AND SOUTHEASTERN COOSA COUNTIES… At 257 PM CST, a severe thunderstorm capable of producing a tornado was located over Cottage Grove, or near Rockford, moving northeast at 50 mph. IMPACT…Flying debris will be dangerous to those caught without shelter. Mobile homes will be damaged or destroyed. Damage to roofs, windows, and vehicles will occur. Tree damage is likely. Locations impacted include… Equality, Speed, Pentonville, Cottage Grove, Western Lake Martin, Highway 9 and Highway 22, Nixburg, Kowaliga Bridge, Southern Lake Martin, Eastern Lake Martin, Fishpond, Central and Ray. …A TORNADO WARNING REMAINS IN EFFECT UNTIL 315 PM CST FOR NORTHERN ELMORE…WEST CENTRAL TALLAPOOSA AND SOUTHEASTERN COOSA COUNTIES… At 243 PM CST, a severe thunderstorm capable of producing a tornado was located over Speed, or 7 miles west of Equality, moving northeast at 55 mph. IMPACT…Flying debris will be dangerous to those caught without shelter. Mobile homes will be damaged or destroyed. Damage to roofs, windows, and vehicles will occur. Tree damage is likely. Locations impacted include… Equality, Speed, Pentonville, Cottage Grove, Western Lake Martin, Titus, Weoka Mills, Jordan Lake, Highway 9 and Highway 22, Welona, Ten Cedar Estates, Nixburg, Kowaliga Bridge, Southern Lake Martin, Eastern Lake Martin, Fishpond, Holtville, Central and Ray. 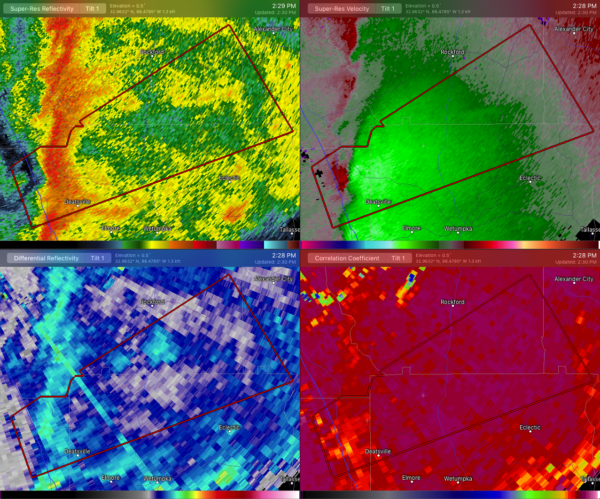 …A TORNADO WARNING REMAINS IN EFFECT UNTIL 315 PM CST FOR NORTHERN ELMORE…WEST CENTRAL TALLAPOOSA AND SOUTHEASTERN COOSA COUNTIES… At 233 PM CST, a severe thunderstorm capable of producing a tornado was located near Titus, or 14 miles northwest of Wetumpka, moving northeast at 55 mph. IMPACT…Flying debris will be dangerous to those caught without shelter. Mobile homes will be damaged or destroyed. Damage to roofs, windows, and vehicles will occur. Tree damage is likely. Locations impacted include… Equality, Deatsville, Speed, Pentonville, Cottage Grove, Western Lake Martin, Titus, Weoka Mills, Jordan Lake, Highway 9 and Highway 22, Welona, Ten Cedar Estates, Nixburg, Kowaliga Bridge, Southern Lake Martin, Eastern Lake Martin, Fishpond, Holtville, Central and Ray. The tornadic thunderstorm which prompted the warning has moved out of the warned area. Therefore, the warning has been cancelled. A Tornado Watch remains in effect until 500 PM CST for central and east central Alabama. …A TORNADO WARNING REMAINS IN EFFECT UNTIL 315 PM CST FOR NORTHEASTERN AUTAUGA…NORTHERN ELMORE…WEST CENTRAL TALLAPOOSA AND SOUTHEASTERN COOSA COUNTIES… At 230 PM CST, a confirmed tornado was located near Marbury, or 12 miles north of Millbrook, moving northeast at 55 mph. IMPACT…Flying debris will be dangerous to those caught without shelter. Mobile homes will be damaged or destroyed. Damage to roofs, windows, and vehicles will occur. Tree damage is likely. Locations impacted include… Equality, Deatsville, Speed, Marbury, Pentonville, Cottage Grove, Western Lake Martin, Titus, Weoka Mills, Jordan Lake, Highway 9 and Highway 22, Welona, Ten Cedar Estates, Nixburg, Kowaliga Bridge, Southern Lake Martin, Eastern Lake Martin, Fishpond, Holtville and Central. * Until 315 PM CST. * At 227 PM CST, a severe thunderstorm capable of producing a tornado was located near Marbury, or 12 miles north of Prattville, moving northeast at 55 mph.